Spurs recorded their seventh Premier League clean sheet of the season on Sunday, but failed to break down a resilient Everton side with similar aspirations. It was difficult to tell whether the reason Tottenham failed to score was down to the Merseysiders’ defensive work or Andre Villas-Boas’ team selection. It was clear, however, that Spurs lacked creativity, as they did against Hull City in their previous league fixture. Aaron Lennon and Andros Townsend started as wide men. Despite his wonder goal against Hull in the Capital One Cup, Gylfi Sigurdsson failed to earn a place in the starting XI. Townsend continued to do what he’s been doing all season: coming deep to collect the ball, running at opposition players and providing a goal threat of sorts. 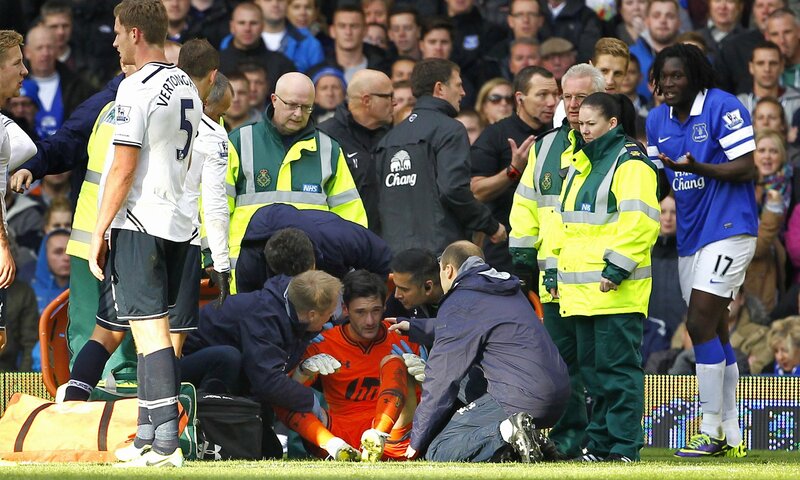 Lennon, on the other hand, struggled on the left hand side once again, having very little influence on the game. Jan Vertonghen was able to get into advanced positions throughout a dominant first half for Spurs. 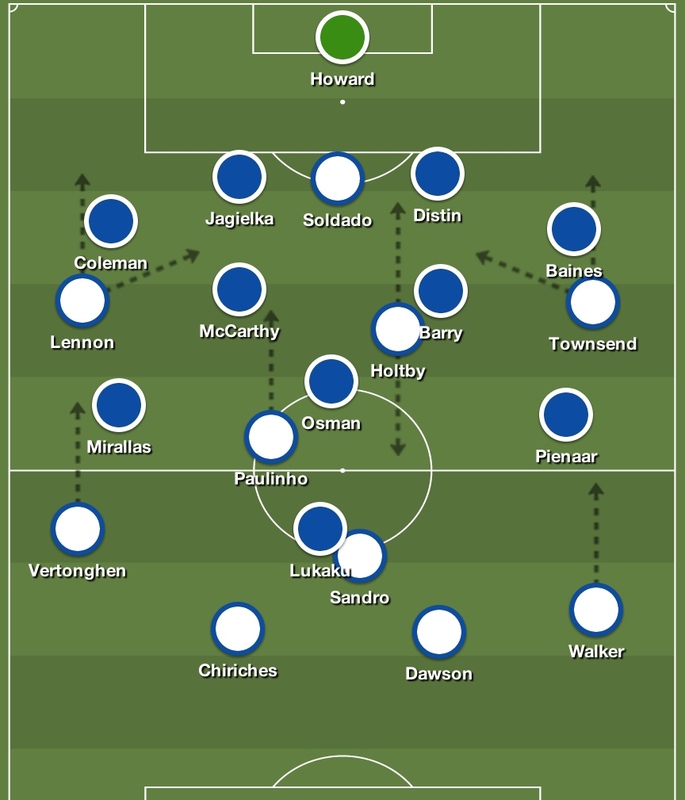 As shown by the image below, the Belgian had much more attacking influence on the match that Lennon. This also aided the visitors defensively. Everton have become renowned for utilising their full-backs’ attacking attributes; Vertonghen made sure Seamus Coleman had more to do at the back than in advanced areas. Townsend’s habit of coming deep to collect the ball from Walker aided Spurs in the same way. Leighton Baines knew he couldn’t allow his England teammate to be positioned in behind him, and so the left-back had to remain deep to prevent Walker and Townsend taking advantage. Unfortunately, Lennon and Townsend are more ‘threatening’ than ‘effective.’ Their pace clearly worried the Everton defence at times, but Spurs lacked the creativity of Christian Eriksen, who has struggled in cameo appearances ever since his superb debut against Norwich. 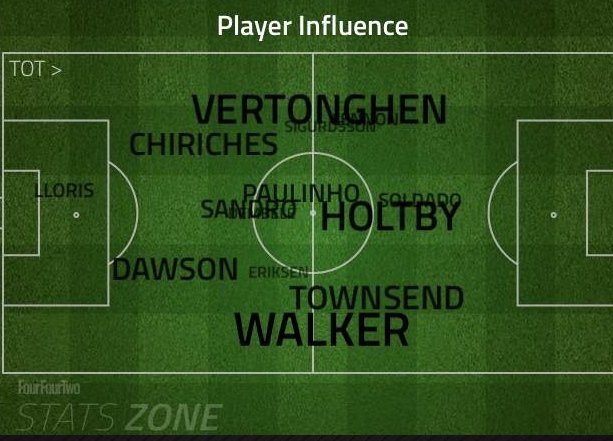 Lewis Holtby continued in the number ten role, coming deep for the ball as he did last weekend against Hull. This allowed Paulinho to get forward more often. Spurs, however, lacked an incisive pass. This is happening too often to the White Hart Lane outfit. Patient passing around the penalty area needs to be replaced by defence splitting through balls. On more than one occasion, Roberto Soldado clearly wanted the ball played in between Baines and Sylvain Distin, but Tottenham appeared to be taking too much of a careful approach. As Everton came into the game, Sandro’s quality shone through. The Brazilian enforcer admirably dealt with the in-form Romelu Lukaku, before being forced off by injury on the hour mark. Mousa Dembele entered the fray, which only further emphasised Sandro’s importance. Baines and Coleman were able to have more of an influence, playing on Spurs’ newfound inability to keep Lukaku quiet. But the visitors remained stable enough at the back. Hugo Lloris’ head injury didn’t stop the Frenchman from playing his usual style of rushing off his line in the final stages. Brad Friedel would have struggled in those last ten minutes with Everton looking to take advantage of the high line. Kyle Walker was brilliant at right-back once again. Another professional performance meant that ex-Tottenham man Steven Pienaar couldn’t get one over on his old club, like last season. He also reliably supported Townsend going forward. Once again, the problem was finding that final bit of creative incisiveness in the attacking third. If Spurs connect the dots up front, their goal tally will surely improve, and one point will become three more often than not.